Removing pubic hair is very common, especially among younger generations. Hair Removal is usually done in salons, but many teens decide to shave your pubic area instead of going to the salon because it is cheaper, more comfortable and overall easier to do. And most importantly, you can do it at home. However, shaving is not as easy as many people think, and there is a right and wrong way to do it. We are here to show you how to do it properly, and now you’ll never make these mistakes again. Trim your pubic hair before shaving. Razors are made for short hair which is why you may have noticed that they become dull after a shave. Your pubic hair should be shorter in order Razor was able to slide smoothly. Take a pair of small sharp scissors and gently pull the hair from the body and haircut. If you feel like you’re clumsy, you can use an electric trimmer without rotary heads, because after all it’s your precious space, and you do not want to get hurt. Nobody cares what color you like razors until the job properly. The most important thing is to have a sharp razor with three or more blades to make shaving easier. And if you do not want to constantly buy new razors need to take better care of them. Use a special razor to the pubic area and always rinse your hair with it and clean it. Never leave wet because water can erode and destroy the razor blades. For the best experience for shaving pull the skin tight with your free hand while you shave the area. Razors work best on flat surfaces. Shaving should be slowly and gently. 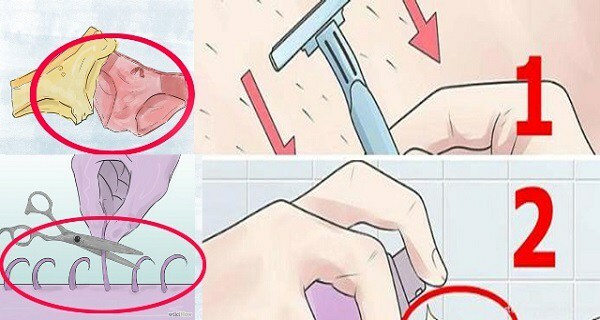 There are two things you need to remember about shaving your pubic hair if you shave in the direction of growth hair will avoid irritation and ingrown hairs if you shave opposite the hair growth you will have a better shave. It is up to you to decide which approach you want, but if you have extra sensitive skin should not shave the contrary grow hair because it can cause complications. You need to be careful not to overdo it with shaving. Do not go over the same area a million times, it will irritate the skin. If you are new to shaving does not shave every day, skip a day or two and let your skin gets used to it. Before shaving, be sure your skin is clean and the pores are open. Use a mild soap and cleanse the area, but do not go beyond the labia. You can use a sugar scrub to purify the skin, or even a mixture of baking soda. This will open the pores and make the area easier to shave and reduce irritation and red patches. After you have washed the remaining hair, dry the area and apply a gentle moisturizer. You can use baby oil or aloe vera, which is excellent for sensitive areas. Do not use perfumed moisturizers because they alone can further irritate the skin.